We were in Bhitarkanika National Park on 19 and 20 March. Everyone said that it was pretty late in the season and our sightings would be minimal. It was true that most of the winter migrants had left. Still the area is so rich in bird life that in three outings in the small area between Khola and Dangamal villages we saw eighty two species. Eighty one of them are listed here. The one I haven’t yet been able to identify is the slate and red bird in the photo below. Contrary to the advise of some experienced birdwatchers, I’d expected this. My confidence was based on the comprehensive checklist published a decade ago which was a result of G.V. Gopi’s thesis work. This work listed a very large number of endemic species. 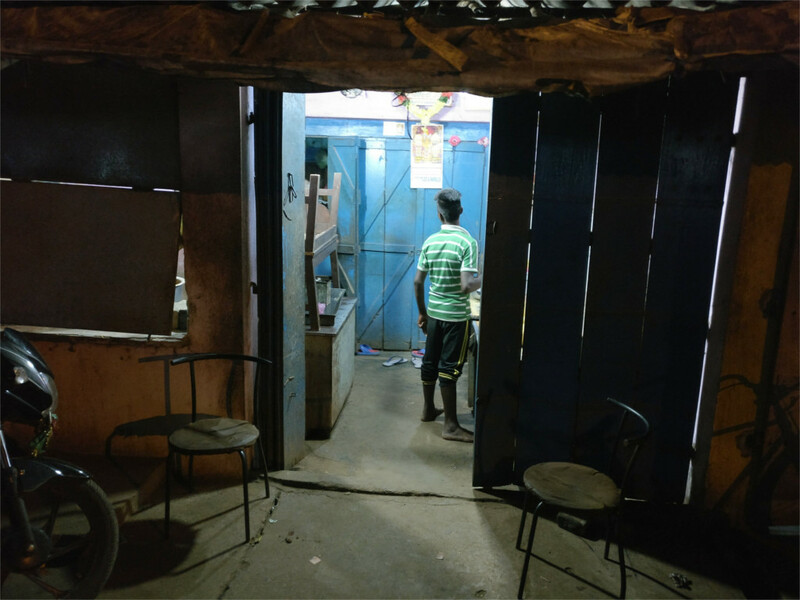 Gopi put me in touch with the people whom he met during his field work, and that helped us enormously. We had several lifers (marked in bold) and saw a few of the species which are globally threatened (marked with a star). Some of the birds I have written about in other posts; they are linked. Interestingly, every species we saw is included in Gopi’s checklist! The list leaves out birds which we heard but did not see. These include not only the ubiquitous Indian Koel and the Common Hawk-Cuckoo (more widely known as the Brain Fever bird, due to its call), but also a couple of owls and a nightjar. Bhitarkanika has several avian habitats. The area that we visited (coloured red in the map here) is reputed to be best for kingfishers and the pitta. Closer to the sea one should see the gulls and terns which we missed completely. There are also multiple viewing season. The time we visited is the leanest. Soon after the end of the monsoon one should be able to see herons nesting. The winter months will bring in the migrants, so loved by bird watchers in India. All this is in addition to the views of saltwater crocodiles, sea turtles and monitor lizards which this place is famous for. I end this post with a mention of the most unlikely sight we saw: a monitor lizard being harried by a flock of Green Bee-eaters. The monitor lizard was probably interrupted in its search for eggs in the nests which the Bee-eaters build on the ground. These birds do not usually flock. They came together to harry the lizard, and successfully drover it away. I was so taken up by the events that I forgot I had a camera. You see wonderful things when you are in a forest. 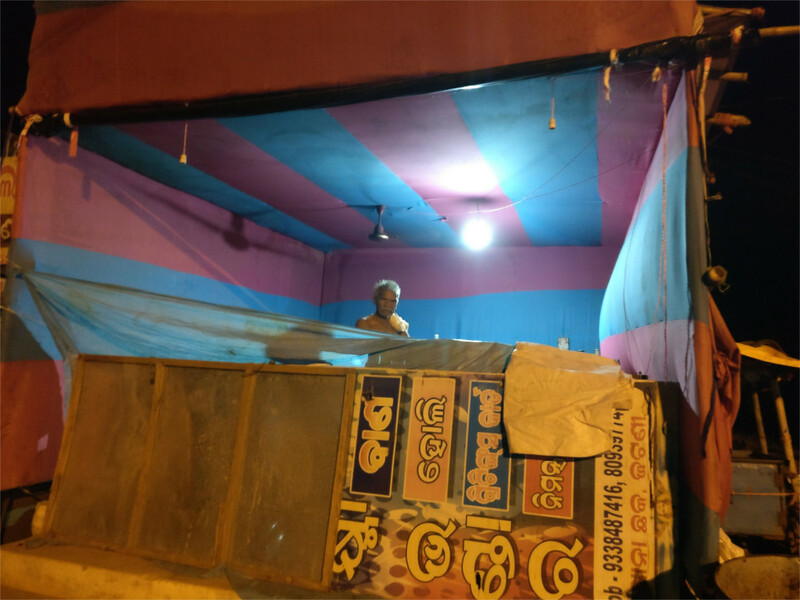 When I talked to people in Bhitarkanika and heard about boats I imagined little things like the one above. My imagination was influenced by photos of birders in Mangalajodi, which is the hot birding destination in Odisha. Imagining an open boat, I was little concerned about the weather. The temperature had started reaching record highs across the country even before Holi. 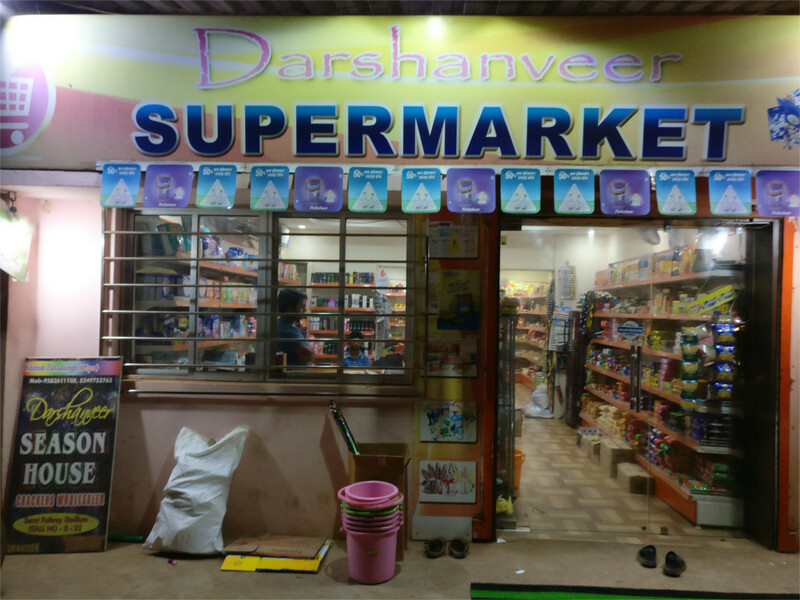 As it turned out, it was only moderately hot when we reached Bhitarkanika. That, and the fact that bird-watching avoids the hot afternoon, meant that we had fairly comfortable weather. 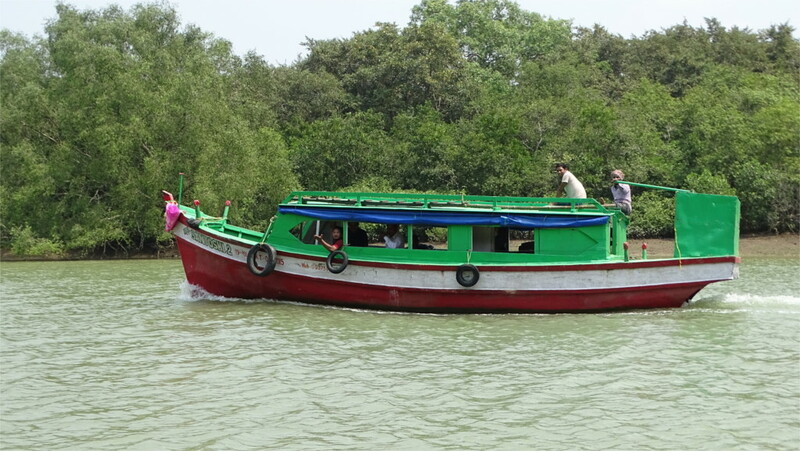 Due to my preconceptions, the first sight of the boats of Bhitarkanika (photo above) was shocking. They are large, with a two person crew, and capable of carrying more than ten passengers. They have a passenger cabin and an upper deck. Interestingly, they also have a head. We decided that sitting in the cabin would restrict our view of the birds, so we climbed up to the deck and leaned on the cabin. The crew handed us cushions and told us to sit on the roof of the cabin. We did that, and can certify that it is a very comfortable way to navigate the tidal creeks of Bhitarkanika while looking out for birds. 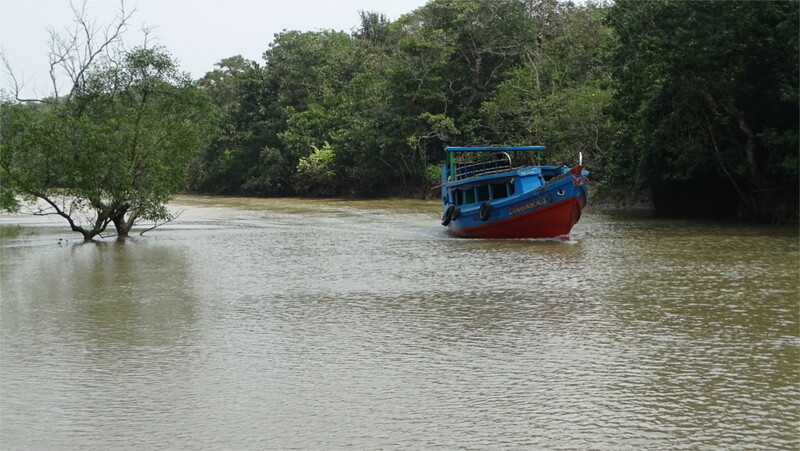 Small boats like the one in the featured photo are used by the locals to travel short distances. Occasionally we saw a man standing in one of these boats, poling himself along a stream. We also saw, once, two men in such a boat, letting out a fishing net. 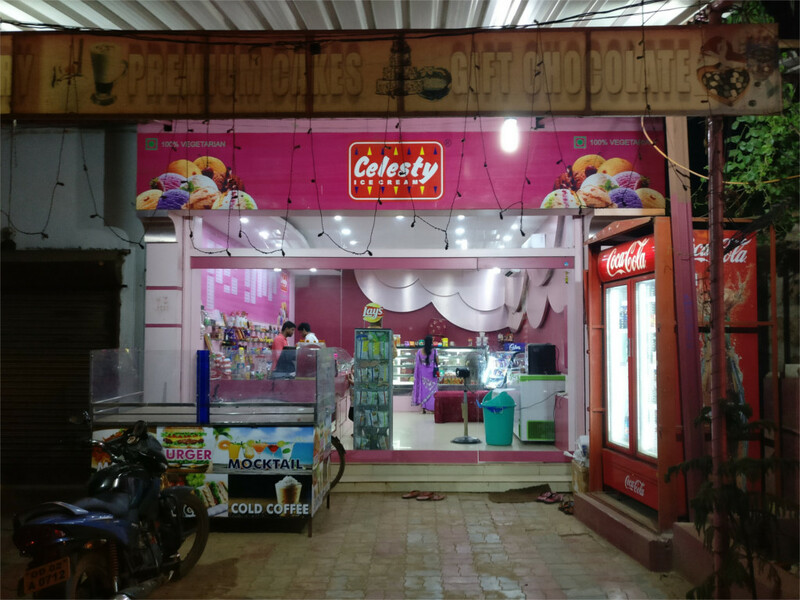 This part of Odisha is poor. While great strides have been made in the last decade or so in bringing schools and primary health care to the people in this region, their income levels have not risen much. Direct employees of the forest department, even temporary workers, are much better off than those who are not government employees. The crew of the boat we were on (one of them is in the photo above) spent time foraging at the edge of the forest, but our wildlife guide did not bother to. This low level of income results in poorly maintained boat engines. There must be expertise out in the wide world on cheap and easy to maintain boat engines with low emission. I would definitely love to hear about it. Two of my early memories merged together very strangely. One is that of the boy who could not keep up with the Pied Piper of Hamelin and spent his life trying to find the place where the piper was leading his friends to. The other is Bob Dylan’s song from which the title of this post is taken. When I hear a woodpecker knocking madly at a tree, they trigger this little chunk of memory in me. As I sat after lunch under a tree in the jungle in Bhitarkanika, I heard the drumming sound of a woodpecker, and came out to look. I saw this wonderful flame back woodpecker searching for its version of paradise. If I were to hit my face rapidly and at high-speed against a tree, I would knock myself out in a few tries. The reasons that a woodpecker survives are visible in the photo. They have to do with modifications to the spine and the way the head is attached to it. The most visible adaptation is the shape of the head. The elongated wedge shape of the head is due to two factors: first the bones at the front of the skull have thickened, and the muscles at the front, which anchor the beak, are immense and serve as shock absorbers. It seems that there are also adaptations in the way the brain is attached to the skull which prevents it from slowly being battered. Another easily observed adaptation is the wide shoulders. This is due to the enlargement of the first set of ribs. The expanded ribs anchor very strong muscles which serve to hold the neck steady. The woodpecker strikes only at right angles to the surface, so that the beak and neck muscles can damp the recoil. A sideways strike would twist its neck. A third adaptation is visible in the photo: the stiff black tail feathers. These balance the woodpecker in its vertical stance on a tree as it drums away. Apparently the last few spinal bones are fused to stabilize the woodpecker. The toes are also adapted to hold on to trunks of trees. All of these features are generic to woodpeckers. The shape of the head, the wide shoulders, the stiff black tail feathers, just a glimpse of these is enough to tell you that the bird you are looking at is a woodpecker. Woodpeckers may have begun to evolve about 40 million years ago, when the shifting of continents began to create today’s weather. The resulting spread of angiosperms and the conversion of sub-tropical forests to deciduous forests created the conditions which we see today. This opened up the ecological niches which the woodpeckers fill today. So many changes are required to adapt to a lifestyle based on digging insects out of the bark of a tree! One of the most striking things about wild animals is how easily they adapt to circumstances; a fancy term for this is behavioural plasticity. 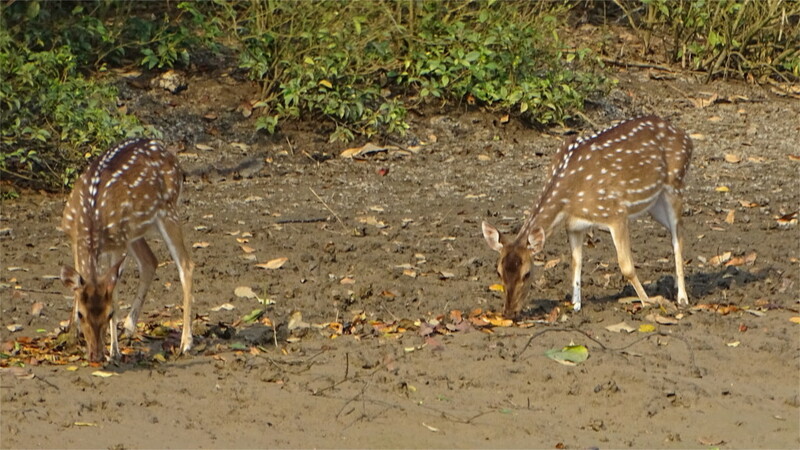 When I saw a group of Cheetal, apparently grazing in the mud next to the tidal creek, I was a little surprised. These animals are grazers, mostly dependent on grass. But the individuals I saw were eating fallen mangrove leaves. You can see them feeding in the photo alongside. In the featured photo you can see its whole body aligned along the tide line where fallen leaves have gathered. The strong reliance on a leafy diet struck me as an adaptation. Another odd fact was that there were so many Cheetal near brackish water. These deer drink a lot of water, and I could not imagine them drinking sea water. It gradually dawned on me that there must be fresh water inland. Amar, our boatman, and Bijaya, our guide for the day, told us about ponds and wells which give sweet water. Around these there are also grassy meadows where we saw some deer. We also saw small bands of rhesus monkeys on the muddy banks of creeks. Strangely, they seemed to be grazing in the mud. Bijaya said they were eating grass. Possibly, because they were certainly not picking up fallen leaves. I never came across them inside the forest, so I don’t know what fruits they eat. Mangrove fruits are unlikely fare for monkeys, but maybe they have adapted. Animal behaviour is so plastic that every niche yields delightful surprises. Walking through the mangrove forest of Bhitarkanika was amazing and humbling. I did not know a single tree or plant. The flower that you see in the featured photo was widespread. I’d first seen it in Andaman, where it had confused me a lot. I photographed one at night and thought it was pink. Then I saw a bush in the morning with yellow flowers. I thought maybe the pink I saw at night was a trick of the light. Now I saw both pink and yellow flowers on the same bush. Bijaya, who was guiding me through the forest, said that the flowers are yellow when they bloom, and then gradually turn pink before they fall off. He didn’t volunteer the name of the plant, and I did not ask. I had read nothing about mangrove species and the trees inland of them. 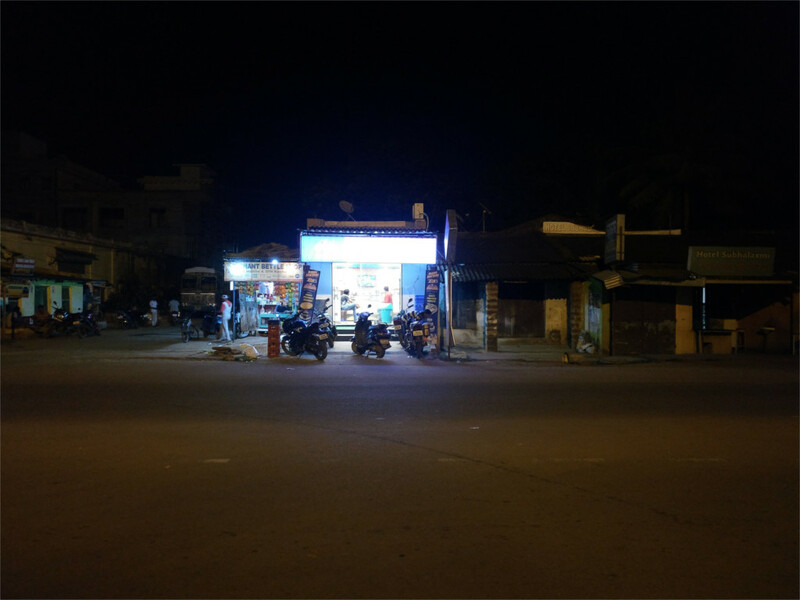 Bhitarkanika is a diversity hotspot, even more so than the Sunderbans. I walked between the colourful trees that you see in the photo above, knowing nothing of why they grow together, what they are, and how they are used by villagers nearby. Still, it was a restful walk, and a great respite from the city. We got off the boat on a rickety jetty badly in need of repair. Behind it the trail disappeared into the forest. As walked through the mangrove forest in the morning, we noticed tracks (featured photo). The ground was unevenly wet, and there was a small section of the path along which there were a few pug marks. It looked like a small cat had walked by. It couldn’t have been very heavy if one was to judge by how deep the marks were. One way to gauge the weight in mud like this is to push your fingers into the ground. The amount of effort it takes to push in your fingers to the same depth gives you an idea of the effort you would make to hold the dead weight of the animal in your arms. The marks could not be very old either, since it had rained quite heavily at night. In any case, Bhitarkanika National Park is not known to hold large cats. It could have been one of the three smaller cats: the jungle cat, the fishing cat and the leopard cat. I haven’t seen any of these. They are shy creatures, like all wild cats, and their small size makes them harder to spot than their more famous relatives: tigers and leopards. Bijaya was certain that it was a fishing cat. But I was not certain that my luck would take me so close to one. A recent census of wildlife inside the park had spotted three fishing cats to eleven jungle cats. Although the census was very likely to be incomplete (it had counted a single hyena) it perhaps can be taken as an indication that there are about four times as many jungle cats as fishing cats in the forest. Unless someone can tell me something about the shape of the pug marks which identifies the species, I think it unlikely that we saw a fishing cat. In my days as a couch potato, I’d read an unlikely book by Douglas Adams, who, in collaboration with Mark Carwardine, went round the world looking for species on the verge of extinction. Not only do I still have Last Chance to See on my bookshelf, I go around the country now with a mental list of endangered species which I want to see. The Lesser Adjutant Stork is one of these, and Bhitarkanika is its only known nesting site outside north-eastern India. The IUCN Red List classifies it as vulnerable (to extinction) because it is “rapidly declining as a result of a variety of threats including hunting pressure, loss of nesting trees, conversion and degradation of wetlands and agricultural changes”. It is thought that the disappearance of this species from the Sunderbans is due to degradation of mangrove diversity in the region. It is one of the most spectacularly ugly birds I’ve ever had the opportunity to see. It is also huge. As we crossed the Brahmani river, The Family spotted some huge birds in a field far away. We stopped to look. They were these ugly storks. The Lesser Adjutant (and its cousin, the Greater Adjutant) is called হাড়গিলে in Assamese and in Odiya (meaning bone eater). When I consulted older people in my family, they remembered the name and the bird. At one time it was probably common in Assam, Bengal, Bihar and Odisha. It can now be seen only in protected forests and wetlands, where it eats small animals and crustaceans. Its local name probably comes by association with the Greater Adjutant, which often scavenges around human habitation. 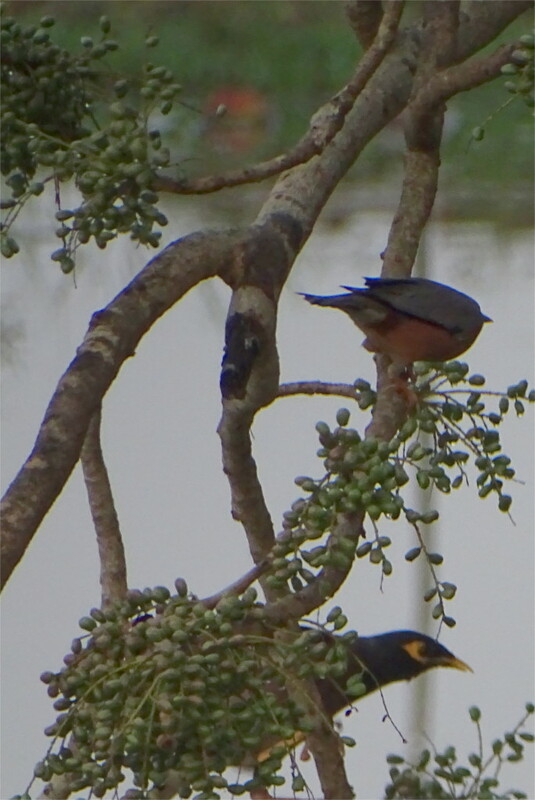 We saw these birds several times in the protected forest. They were wary of our boat, and tended to fly whenever we came within camera range. Eventually I caught a juvenile sitting on top of a tree. The juvenile has much more down on its bare neck and head than the adult. Apparently these birds have extremely sharp vision, and this one could have been sitting there to scan the area for food. One never knows which sighting of this bird could be the last. 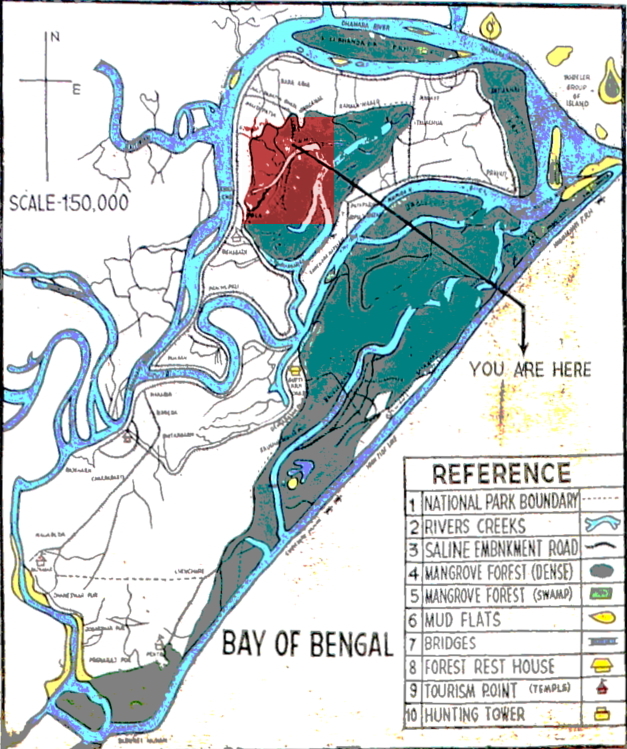 When India joined the Ramsar convention for protection of wetlands in 1982, Bhitarkanika National Park was not the among the first places listed. The 65,000 hectares of this park was listed under the treaty twenty years later. The mangrove forests of the Sunderbans are larger in area, but Bhitarkanika has more species diversity: only three of India’s 58 species of mangroves have not been seen here. Mangrove forests stabilize the coastline, reducing erosion from storm surges, currents, waves, and tides. The intricate root system of mangroves also makes these forests attractive to fish and other organisms seeking food and shelter from predators. When you pass through the tidal creeks which thread the wetlands, the mangroves appear as a dense forest wall surrounding you. 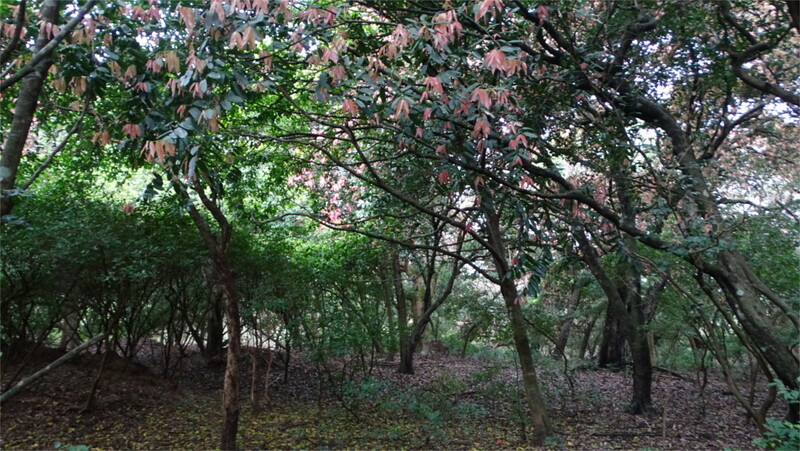 There are designated trails through the forest. If you take these, you find that the forest is thin, and hides open wetlands. Interestingly, there is freshwater very close to the sea here. The sparse villages around the region have a tradition of creating ponds around each home, so recharging the groundwater that they draw. Unfortunately, this traditional conservation measure has been undone recently by the increased shrimp farming in this area. The mangroves are drowned by the tide surging up and down the creek twice a day. Most trees which stand with roots in water would die. Mangroves have solved this problem in two ways. First, they have evolved unique physiologies which allow it to filter out salt from the water and excrete it. 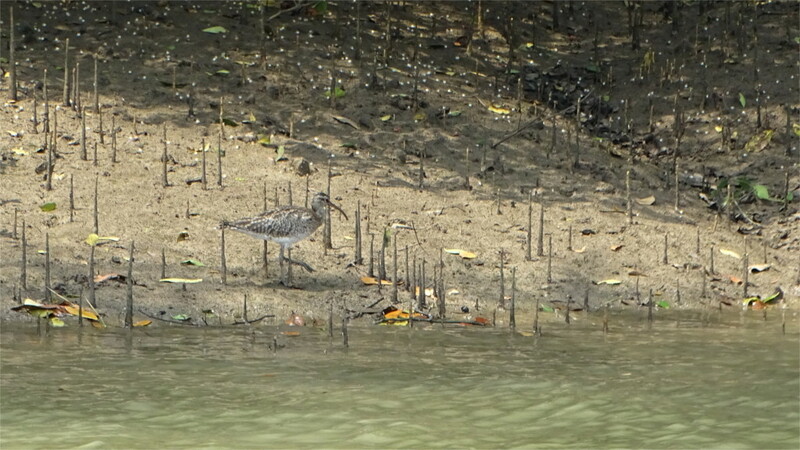 Second, some of them stand in an interlocking mass of prop roots to hold them out of the water while others have snorkels called pneumatophores (photo below: the spikes amongst which the whimbrel is foraging). This area is the delta of a complex of muddy rivers. The mangrove roots hold back the soil and slowly build up the land. Bangladesh is said to have created 120,000 hectares of new land in the Bay of Bengal by planting new mangrove forests. As temporary refugees from a city, we breathed in the clear air of the forest. The Family was reading a study which claimed that mangroves lock up more than a 100 kilograms of atmospheric carbon per hectare per day, and is one of the most efficient ecologies for soaking up greenhouse gases. 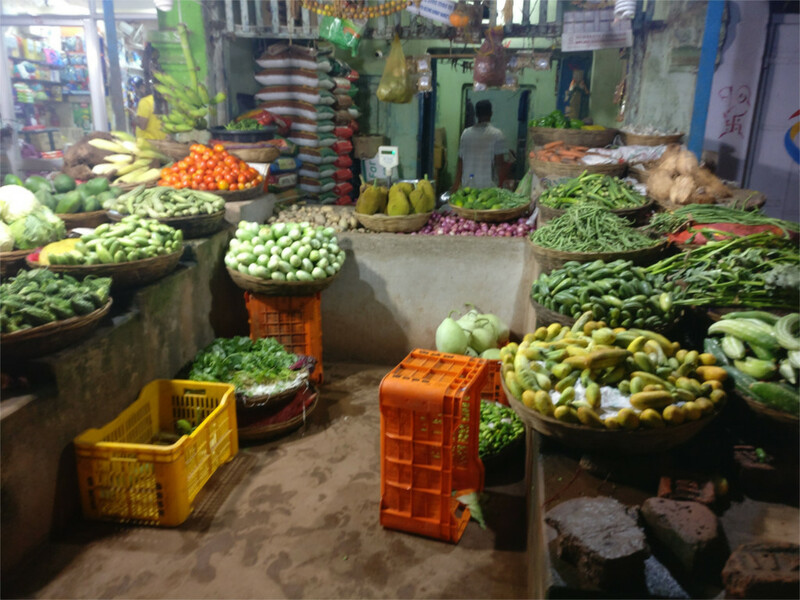 The three decades-long conservation effort in Bhitarkanika started before the Indian Ocean tsunami taught coastal countries the wisdom of replanting mangroves. Now this may serve as an ark which repopulates the disappearing mangrove forests along the coast of India. 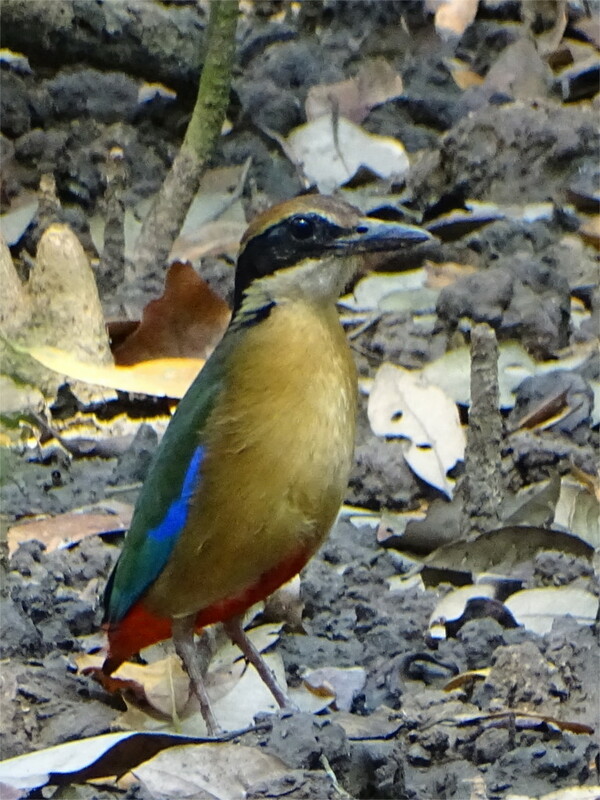 We were very lucky with our sighting of the Mangrove Pitta. 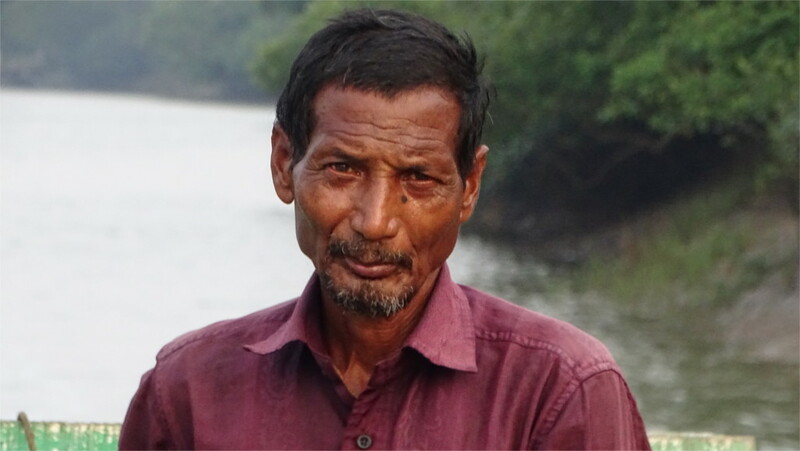 As soon as our boat docked at the jetty in Dangamal, Amar, the boatman, jumped off the boat and asked us to hurry. Bijaya had called him to say that two Pittas had been sighted very close to the jetty. We hurried after Amar and saw Bijaya with a couple of people with the cameras and large lenses typical of wildlife photographers. One of them pointed out the bird. It was sitting in a bush, facing us, as you see in the featured photo. It turned, hopped down to the ground, and offered many different views to the camera. You can see examples of these views in the rest of this post. The two photographers, Bijaya, Amar, The Family and I watched the bird foraging on the floor of the jungle. Several large groups of crocodile watchers passed by. Some stopped to examine us, and left when they found nothing of interest to them. 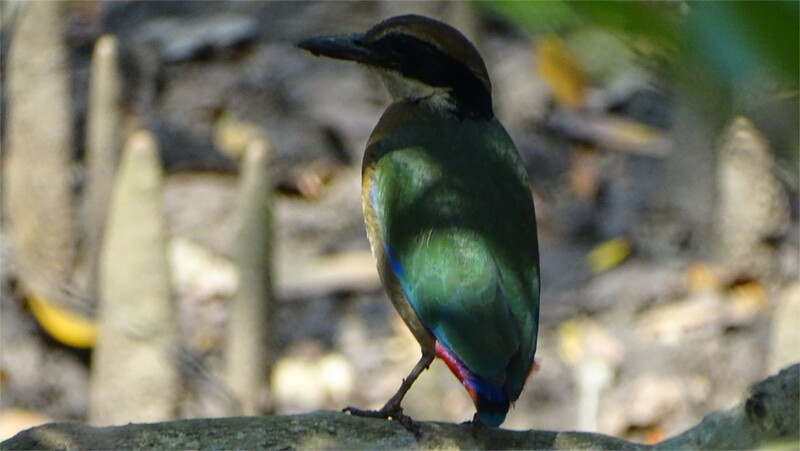 The origin of the colourful plumage of the Pitta has been a matter for speculation for long. It builds an open nest on the ground. Darwin and Wallace sparred for many years over the selective reasoning behind coloured birds with open ground nests. The argument was about the visibility of these nests to predators. Today we understand that their argument was important but premature, because the vision of birds and their major predators are not like human vision. Human eyes became red sensitive fairly late in evolution. Avian vision switched to ultraviolet sensitivity in many independent events (but not in the Pittas). The Mangrove Pitta is called the Queen of Bhitarkanika on tourism posters. Humans seem to find its brilliant colours very attractive. It is the species on the cover of Grimmett, Inskipp and Inskipp’s field guide. Do Pittas also see the brilliant plumage that we are attracted by? I have seen no argument or study that clinches the issue one way or the other. However, it seems to me reasonable to assume that if the plumage was not under selective pressure in some way, it would change more easily over time, and one would be able to see races of Pittas with different colours. On the contrary, many species of Pittas have similar colouration. We didn’t see a Pitta again, although we heard their distinctive call several times. Inside the forest it was hard to imagine that these lovely birds are on the decline. IUCN classes this as near-threatened due to habitat loss. Bhitarkanika National Park, with its protected mangrove forest, plays an important role in the conservation of this species.